Nutritionally: Sharply increases the utilization efficiency of NPK and other fertilizers in soil. Physically: Optimizes soil structure, boosts the capacity of water holding and cation exchange and improves aeration condition. Besides, these benefits will be further helpful for plants to resist drought stress. Chemically: As chelating and buffering agent, helps hold water soluble inorganic fertilizers, prevents them from leaching and protects plants from drastic change in pH. Biologically: Establishes a desirable environment for microorganism development, stimulates root respiration, formation and growth, and thus increases crops yield and improve the quality. 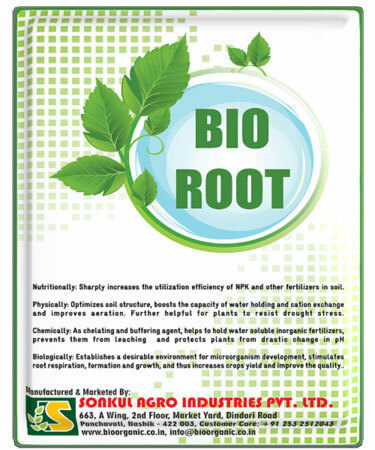 BIO ROOT increases water holding capacity of soil and helps to reduce soil erosion. BIO ROOT Stimulates growth of white (Active) roots. BIO ROOT increases the efficacy of fertilizer by preventing nutrient leaching from the root zone and ensuring sustained release of nutrients to the root zone as needed by plants. BIO ROOT Promotes nutrient uptake by plants and enhances the soil's ability to chelate nutrients and to promote exchange of nutrients between plants and the fertilizers being applied. BIO ROOT increases the permeability of plant membranes; thereby enhancing the nutrient uptake. BIO ROOT improves the soil environment needed for the uninterrupted growth of various groups of beneficial micro-organisms. BIO ROOT buffers pH problems, allowing plants to adapt better. BIO ROOT promotes the conversion of nutrients into forms available to the plants. BIO ROOT Increases the germination capacity of seed via the improved CEC levels of the soil. BIO ROOT conditions the physiological processes of crops, Increases the ability to tolerate stress, insects, coldness and drought. BIO ROOT Promotes the formation of good soil structure, increasing the cation exchange capacity (CEC), water-holding capacity, and the capacity of fertilizer retention. BIO ROOT reduces the toxic effect of residual amounts of herbicides, soil pollutants, heavy metals, and other harmful substances, as well as chemical contamination. BIO ROOT can be mixed with organic manures and fertilizers, applied as seed soaking treatment, root application or used directly during fertigation. Mix 1-2 kg BIO ROOT with chemical fertilizer or organic manure. Dissolve 1-2 kg BIO ROOT in water and apply in the root zone through drip system. Mix 5-10 gm BIO ROOT in 1 liter of water and apply near root zone by drenching. Mix 5 gm BIO ROOT in 1 liter of water and dip seedling roots for 5-10 minutes before transplanting. Mix 5 gm BIO ROOT in 1 liter of water and soak seeds for 15 minutes. Dry seeds in shade before sowing.